In this article, we have suggested new methods of ratio exponential type imputation and proposed their corresponding point estimators to deal with the problems of non-response in sample surveys for the prior outlay of an auxiliary variable $x$. The expression of the biases and their mean square errors of the proposed estimators have been derived, upto the first order of large sample approximation under SRSWOR scheme and compared with the mean method of imputation, ratio method of imputation, regression method of imputation and the estimators of Singh and Horn (Metrika ), Singh and Deo (Statistical Papers ), Toutenburg et al. (Statistical Papers ), Singh (Statistics ) and Gira (Applied Mathematical Sciences ). After comparison, the condition which makes the proposed forty four estimators more efficient than others are found. To verify the theoretical results, simulation studies are performed on five real data sets. Ahmed, M. S., AL-Titi, O., AL-Rawi, Z., & Abu-Dayyeh, W. Estimation of a population mean using different imputation methods, Statistics in Transition, 7 (6), 1247-1264, 2006. Cochran, W. G. Sampling Techniques, 3rd edn, Wiley and Sons, 1977. Das, A. K. Contribution to the theory of sampling strategies based on auxliary information (Ph. D). thesis submitted to Bidhan Chandra Krishi Vishwavidyalaya, Mohanpur, Nadia, West Bengal, India, 1988. Diana, G. and Perri, P. F. Improved estimators of the population mean for misssing data, Communications in Statistics-Theory and Methods, 39, 3245-3251, 2010. Gira, Abdeltawab A. Estimation of population mean with a New Imputation Methods, Ap- plied Mathematical Sciences, 9 (34), 1663-1672, 2015. Heitzan, D. F. and Basu, S. Distinguishing 'Missing at Random' and 'Missing Completely at Random', The American Statistician, 50, 207-213, 1996. Kadilar, C. and Cingi, H. Ratio estimators for population variance in simple and stratified sampling, Applied Mathematics and Computation 173, 1047-1058, 2006. Kadilar, C. and Cingi, H. Improvement in variance estimation using auxliaiary information, Hacettepe Journal of Mathematics and Statistics 35 (1), 111-115, 2006. Kadilar, C. and Cingi, H. Estimators for the population mean in the case of missing data, Communications in Statistics-Theory and Methods, 37, 2226-2236, 2008. Kalton, G., Kasprzyk, D. and Santos, R. Issues of non-response and imputation of income and program participation, Currents Topics in Survey Sampling (D. Krevoski, R. Platek and J. N. K. Rao eds. ), Acad. Press, New York, 455-480, 1981. Murthy, M. N. Sampling theory and methods, Statistical Publishing Society, Calcutta, India, 1967. Rubin, R. B. Multiple imputation for non-response in surveys, John Wiley, New York, 1987. Sande, I. G. A personal view of hot-deck imputation procedures, Survey Methodology, Sta- tistics Canada, 238-247, 1979. Singh, G. N., Priyanka, K., Kim, J. M. and Singh, S. Estimation of population mean using imputation techniques in sample surveys, Journal of Korean Statistical Society, 39 (1), 67-74, 2010. Singh, S. and Deo, B. Imputation by power tranformation, Statistical Papers, 44, 555-579, 2003. Singh, S. and Horn, S. Compromised imputation in survey sampling, Metrika, 51, 267-276, 2000. Singh, S. A new method of imputation in survey sampling, Statistics, 43, 499-511, 2009. Toutenburg, H., Srivastava, V. K. and Shalabh, Amputation versus imputation of missing values through ratio method in sample surveys, Statistical Papers, 49, 237-247, 2008. ISNAD Prasad, Shakti . "A study on new methods of ratio exponential type imputation in sample surveys". 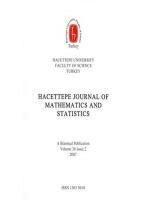 Hacettepe Journal of Mathematics and Statistics 47 / 5 (October 2018): 1281-1301.